ID3 is the first of a series of algorithms created by Ross Quinlan to generate decision trees. ID3 is harder to use on continuous data (if the values of any given attribute is continuous, then there are many more places to split the data on this attribute, and searching for the best value to split by can be time consuming). ID3 is a precursor to both C4.5 algorithm, as well as C5.0 algorithm. The ID3 algorithm is used by training a dataset S to produce a decision tree which is stored in memory. At runtime, the decision tree is used to classify new unseen test cases by working down the tree nodes using the values of a given test case to arrive at a terminal node that tells you what class this test case belongs to. More details on both Entropy and Information Gain you’ll find here. is a measure of the amount of uncertainty in the (data) set S (i.e. entropy characterizes the (data) set S). it makes sense to define information as the negative of the logarithm of the probability distribution (the probability distribution of the events, coupled with the information amount of every event, forms a random variable whose average (expected) value is the average amount of information (entropy) generated by this distribution). # Calculates the entropy of the given data set for the target attribute. it is a synonym for Kullback–Leibler divergence (in the context of decision trees, the term is sometimes used synonymously with mutual information, which is the expectation value of the Kullback–Leibler divergence of a conditional probability distribution. The expected value of the information gain is the mutual information I(X; A) of X and A – i.e. the reduction in the entropy of X achieved by learning the state of the random variable A. In machine learning, this concept is used to define a preferred sequence of attributes to investigate to most rapidly narrow down the state of X. Such a sequence (which depends on the outcome of the investigation of previous attributes at each stage) is called a decision tree. Usually an attribute with high mutual information should be preferred to other attributes). # Calculates the information gain (reduction in entropy) that would result by splitting the data on the chosen attribute (attr). # Calculate the sum of the entropy for each subset of records weighted by their probability of occuring in the training set. bases the assignment of a label on the predominance of a particular class in this neighborhood. and the value of k, the number of nearest neighbors. and the class labels of these nearest neighbors are then used to determine the class label of the object. 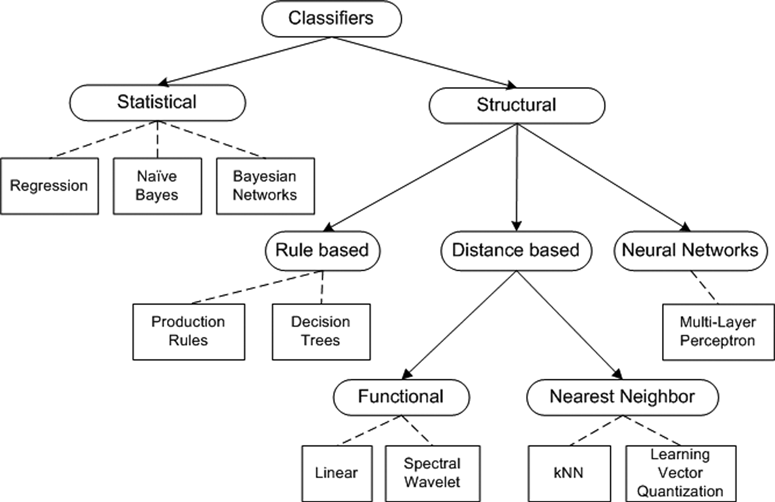 Figure below provides a high-level summary of the nearest-neighbor classiﬁcation algorithm. Import NumPy (package for scientific computing) and the Operator module (sorting tuples). NumPy requires previous installation from here. Some time ago while reading the journal of Knowledge and Information Systems (KAIS; vol. Dec24, 2007) i came across a paper titled “Top 10 Algorithms in Data Mining”. This paper was presented at the IEEE International Conference on Data Mining (ICDM; 2006 Hong Kong), and a companion book was published in 2009; edited by the authors of the mentioned paper (Xindong Wu, Vipin Kumar et al). Below you’ll find my rough notes (which you still may find useful) as well as my descriptions of some of the Top 10 Algorithms presented in the aforementioned paper. Data collection – using publicly available sources, API’s, RSS feeds, sensors, etc.